This past Saturday, November 23rd, the Gathering served a Thanksgiving brunch that consisted of turkey, dressing, mashed potatoes, TONS of pies (with whipped topping, of course), gravy, sweet potatoes, yams (with marshmallows and brown sugar), cranberry sauce and carrots. 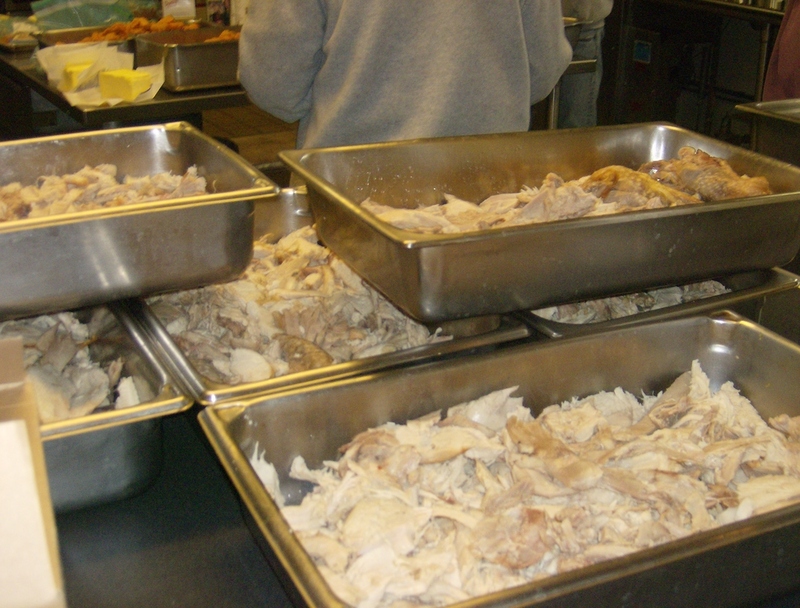 590 guests were served at our three Saturday meal sites. The Gathering has been so blessed to have numerous volunteers and generous individuals calling in to inquire about volunteering on Thanksgiving Day. While we appreciate the community support, the Gathering does not serve on the day of Thanksgiving (Thurs. Nov 28th). We serve ten meals every week throughout the year. On Thanksgiving Day, many of our guests take the day to be with family. In addition, there are many service organizations/churches/food pantries, etc. that serve delicious meals on this special day. So instead of repeating meals, we focus our attention on a meal the Saturday before Thanksgiving Day. An AMAZING number of group and individual volunteers worked together to make the meal happen. Special thanks to Fox Point Lutheran Church, Immanuel Presbyterian, St. Mark’s Episcopal, Joe Bruno and more for preparing turkeys. In addition, thanks to Southwood Glenn Elementary’s Market Day, Milwaukee College Prep, Joy Global and more for bringing amazing pies. Also SPECIAL THANKS to all of our cooks, coordinators and volunteers at the meal on Saturday. We could not have done it without you.